Everyone can remember a time in his or her life when words weren’t enough to explain the heartache. It was as if there was no way to say out loud what the grief, the shame, or the anger felt like, or at least, nothing sounded quite poignant enough to describe those feelings. Perhaps, as a result, some have experienced the release of drawing, painting, or sculpture. These calming, sometimes accidental methods of maintaining calm or working through emotions do something that talking sometimes can’t. If you haven’t experienced this, or if you know someone that could benefit from this type of expression, then Art Therapy is a worthwhile resource to explore. However, what Art Therapy is not, may be equally important as what it is. For example, Art Therapy provided by a trained professional can’t be substituted for services by someone who does not have such training. 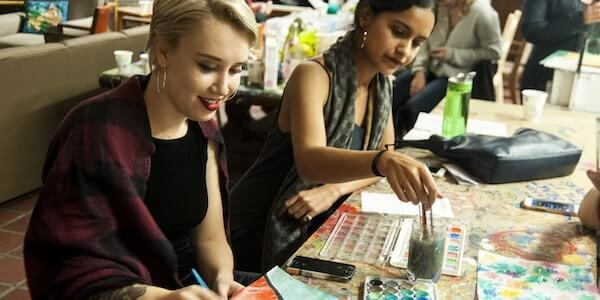 The term “Art Therapy” has been modified to suit a larger group of people, and it has evolved in this do-it-yourself culture to include products that aren’t specifically used and sanctioned by professional Art Therapy practitioners. Traditionally, Art Therapy apps and adult coloring books can’t be classified as Art Therapy unless they are designed by licensed professionals. Often this lack of credentials is the case with mass-marketed adult coloring books (About Art Therapy, 2017). However, this doesn’t mean that coloring apps and adult coloring books, among many other resources outside of the counselor’s office, aren’t good for self-care. These methods are excellent for as-needed use, and there are professional resources that can be turned to as well. Art as a means for healing and communication is of particular relevance for children and teens. Young children often have to rely on limited language to express complex thoughts and emotions, and there’s a barrier that can be breached with things they understand a little better, things like drawing and coloring. It’s no less important in teens to have that pressure-free, consequence-free medium for their thoughts and feelings. These activities will provide that necessary communication buffer to the younger age groups. Print out the PDF and have clients write a message to someone they’re frustrated with or to someone with whom they have something to share. One the blank side, have the client express their feelings with art. Teens are vulnerable to harsh, judgmental environments where they don’t feel they can be themselves. They may suppress their true character to avoid censure from their peers, and it’s for this reason that it’s important for teens to identify their core values or identify who they think they are and write it down. Set out magazines, newspaper, scrapbook paper, and other art materials to allow students to form into a collage. Ask participants what words they live by. If students don’t know, it might be helpful to have some quotes laid out already that they can use. Click here for more information about this exercise. Humans are all tactile creatures, but children especially are the touchers, explorers, and the curious feelers of us. It’s a way for them to learn about the world, and as with the rest of us, to find comfort. In a group with young children, I recommend using materials like glue sticks as opposed to glue bottles and having pre-cut pieces of material ready. On a blank, stiff piece of paper, have the participant create a mural out of soft materials. Perhaps in an older group, using homemade knitting or crocheting blocks would be a great way to add some time, pride, and relaxation into the project. Glue the material to the page, taking the time to really dwell on the textures, to feel, and to arrange in a way that feels right. This activity could easily be transformed into a guided group activity by adding themes like: using the blocks of fabric, depict an event that is painful for you or a person with whom you have painful conflict, or a part of yourself you’re unhappy with. With this project, you are literally softened by the act of depicting it, rendering painful things into pleasant things. (100 Excellent Art Therapy Exercises for Your Mind, Body, and Soul, 2011). Building a safe place is an activity that’s adaptable for all age groups, but maybe a sensitive project for kids and young adults who often have little control of their environments, who may struggle to ever feel safe. This project may help a child or teen to reflect on ways to find a safe space, or may simply help them feel like they have some control over their environment. Using materials like cardboard boxes, popsicle sticks, or folded poster board could be more fun for an older age group, but for young children using materials on a two-dimensional surface would be easier. Arrange the materials to create or depict a place that feels safe. Participants may not have a real place where they feel safe and should be encouraged to imagine it in whatever way they’d like. For more information about this exercise click here. This set of three worksheets includes exercises for children to express their emotions, or to define the things they care about. Print and distribute the worksheets. Allow the children to interpret how to fill their hearts, or specifically instruct them to represent their emotions in the heart. You can find the worksheets here. Just because adults have more experience with language doesn’t mean they are any better at understanding their own emotions and telling others what they’re experiencing. Often, in dealing with adult problems, it’s even harder to articulate what hurts and why. Here are some adult activities for the older, no less young-at-heart who need an activity to better understand themselves. Distress from pent-up emotions and complex experiences that need articulation is a common experience for people in caring professions. Art Therapy has been shown in end-of-life caretakers to a be a promising therapy in helping the caretakers feel competent, develop emotionally-focused coping skills, and increase emotional awareness, an essential skill to prevent burnout (Potash, J.S., Chan, F., Ho, A.H.Y., Wang, X.L., Cheng, C., 2015). Caring professionals need the defense against burnout that Art Therapy can provide, but any adult is susceptible to burnout and could use the coping skills that come with it. While these exercises might not be performed by a professional Art Therapist, many of them were developed and used by Art Therapists or can still make a difference for the individual seeking release. This activity was created for people who suffer from Eating Disorders or who have body image problems. People who suffer from these afflictions create masks to hide behind that operate as distractions for other problems, that keep people from seeing their suffering, or that keep them from seeing their own dysfunction. Creating the mask can be done individually or in a group setting, and it can help participants discover suppressed parts of themselves that they hide behind the masks, find coping strategies for life difficulties that aren’t food or body preoccupation related, and confront a fear of what would happen if the body/food-focused mask was removed (Art Therapy Blog, 2017). Cut plaster tape into varying lengths and keep dry. Apply vaseline lightly to the area of the face that the mask will cover and keep hair free of the area. Dip plaster strips in water and apply them to the face, making sure the parts of the strips with the extra plaster are facing out. Create another coat of plaster strips, making sure to put extra tape around the bridge of the nose. Let dry for fifteen minutes. Remove mask and let dry for twenty-four hours. On a separate piece of paper, plan what will go on the mask that will answer or represent the objectives of the exercise. When masks are complete, they may be used in role play to further explore the issues represented on the mask. You can read more about this exercise here. Activities like this one would be good for children and adults, but an older group or individual may better appreciate the depth and symbolism of the project. For those who feel lost, overwhelmed, or isolated, expressing it and visualizing hope on the shore would be a therapeutic and beautiful way of identifying needs, feeling hope for the future, or realizing where they are on a specific journey. Visualize being lost at sea on a stormy night with a glimmer of light leading to land. If you row hard, you know you can make it. Warm food, dry clothes, and rest will be waiting at the shore. Affirmation and inspiration are the keys to the self-care box. It can be comforting to have something small, tangible, and beautiful in times of trouble. The box can be used as a resource and its ongoing creation can be therapeutic for the user. Using a cardboard box and other art materials, decorate the box while keeping in mind that this will be the home for trinkets and small items of importance. Decorate or line the box with positive affirmations. These can be self-generated, generated by group members, or found online. These can also be simply folded and put into the box to be read when needed. Self-criticism can make the act of creation difficult, and often that difficulty in finding the words to express your feelings is because you’re self-conscious of what you’ve written and how inadequate the expressions feel. By creating a poem out of words you choose without having to draw them from your head, you can create an un-self-conscious poem that molds pre-existing words to your own feelings. Collect materials like magazines, newspapers, old books, and scrap paper. Cut out words that stand out to you or inspire you. Collage the materials you found just as you would with a visual collage. You can begin the project with a story or theme in mind, or you can allow the word choices to decide the end result. You can read more about this technique here. The Family Sculpture exercise is a popular Art Therapy exercise that exists in many other therapy types in a modified form. It is enlightening for clients to mold their family in a way that represents the members and the dynamics, and it helps to identify problems in relationships that otherwise might have been ignored. Using simple modeling clay or Plasticine, mold family members to be abstract representations of their personalities. Position the members in a way that represents the dynamics of the family. Anxiety can be crippling. It can wreak havoc in your most treasured relationships, can make it difficult to leave the house or go to work, and it can make day-to-day life feel hazardous and lonely. More than eighteen percent of the population of the United States each year is affected by anxiety disorders, adding up to forty-million adults aged eighteen and older (Facts & Statistics, 2017). Unfortunately, anxiety goes untreated a great deal of the time, which means that millions of afflicted adults either have no means of coping with their anxiety or are coping in whatever ways they are able, which may be doing more harm than good. One of the most enlightening parts of Art Therapy is the process of creation which is as revealing as the final result. For people with anxiety, there may be an intense need to finish the project, to clearly delineate the details, to create subject matter that is universally appealing. This was the situation in a case study conducted by Cherubina Albertini whose client suffered from Agoraphobia with Anxiety and Panic Disorder. While the client benefited from the creation of the art, the therapist was able to discover some of the origins of her client’s anxiety through discussing the works and watching her process (Contribution of Art Therapy in the Treatment of Agoraphobia With Panic Disorder, 2001). For anxiety sufferers, self-discovery and healthy coping mechanisms are essential, and Art Therapy techniques are among the healthiest ways to deal with the complications of life with Anxiety. Get a sketchbook, notebook, or even an old paperback book that you don’t want to read anymore. Collect materials like magazines, paint, markers, color pencils, stamps, and more, being sure to build a reserve of materials that will go into making something you feel satisfied with. As a theme for each page, create a collage or drawing of things that you love and that make you feel calm, e.g. the beach, the library, a poem, the face of a loved one. You can read more about the Panic Book here. Understanding and visualizing anxiety can be a pivotal first step in controlling and treating it. Representing anxiety as human, abstract, or monster could help the artist develop strategies to recognize it when they feel it and to deal with it appropriately. Draw, paint, or create a collage considering these suggestions as a template: If anxiety had a body (and personality) what would it look like? How would it talk? What does it care about? What does your body look like with anxiety? What would it look like if anxiety was no longer present? Art Therapy for treating anxiety can be counterproductive in clients who are anxious about creating art. The visual starter exercise is a way around this, helping the artist to get started without being self-conscious. The starters can be adapted to specific prompts or used solely for healthy stress-relieving creation. Using the PDF of “starters,” draw what one of the shapes inspires. Similar to a worry stone or fidget cube, mindfulness beads can be a simple, cheap coping mechanism that’s fun to create and easy to carry around. Go to a bead store and pick out beads that stand out to you. Create a string for a keychain or a bracelet, placing the beads in an order that appeals to you. Drawing patterns and allowing your brain to enter a peaceful flow state reduces anxiety and generally helps with a feeling of peacefulness, slowing down time and focusing moment to moment. Zentangle was created with the promise that anyone can do it, even if they didn’t think they could draw well enough to create something beautiful. Drawing Zentangles creates a feeling of accomplishment and helps to pass time in a thoughtful, healing way. Before drawing, take a moment to feel gratitude and express appreciation for the materials and the opportunity to create something beautiful. Draw four dots, one in each corner, so the page is no longer blank and intimidating. On a square piece of paper, lightly draw a border in pencil. Draw a “string” or multiple “strings” in pencil to divide the page and create an outline. Using a pen, draw confident strokes in defined shapes, not worrying about what it is or what it looks like, usually keeping inside the borders and within the string outline. There is no up and down, so rotate as needed without regard to “proper” orientation. Shade with a graphite pencil. 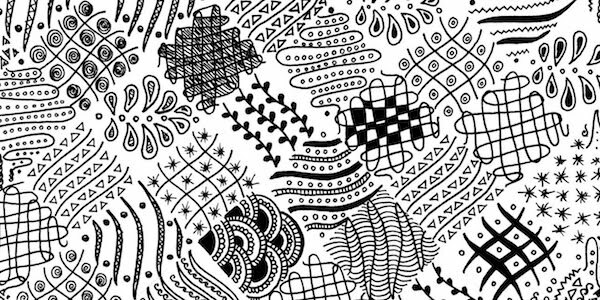 Traditionally, Zentangles are done in black and white, but some unofficial sites condone use of color in the Zentangle. Initial and sign your creation, stamping it with pride that you just made something unique and appealing. You can read more about Zentangle here. Whether you’re looking for additional education on Art Therapy, or you’re wanting books with exercises and coloring patterns, here are resources to explore as a professional or an individual who wants to personally educate themselves on the field. Maldiochi’s book is like the textbook of Art Therapy self-education. She defines ways to perform Art Therapy yourself and how to interpret the results. Maldiochi also has a growing legacy of Art Therapy publications that would benefit the casual learner and professional alike. Edith Kramer is known in the field of Art Therapy as a pioneer for the field. This collection of papers touches on many topics relating to therapy, art, society, and clinical practice. This would be a good resource for those considering entering the field of Art Therapy as a profession. For practitioners and individuals, Buchalter’s and Navarro’s workbook contains exercises that combine many different art mediums, mindfulness exercises, and counseling programs. Found on the official Zentangle website, this book is a beginning educational source on the development of the Zentangle that includes completed Zentangles for inspiration. They describe it as a left brain, right brain resource for the conjunction of the pictures and the words together. In a study by Nancy Curry and Tim Kasser, participants were found to have reduced anxiety after coloring plaid and mandala patterns that put them into a meditative state (Can Coloring Mandalas Reduce Anxiety?, 2005). A coloring book full of meditative mandala patterns would be a worthy investment for reducing anxiety and practicing Art Therapy self-care. Art Therapy is a fledgling therapy next to the giants of Talk Therapy and others, but its combination with other relevant therapies and worldwide success in treating disorders has garnered a great deal of respect for the profession that’s making an impression. If you’re interested in becoming a licensed Art Therapist, do some research about what regions would recognize your licensure when it is obtained. Most importantly, research Art Therapy more fully and find out what Art Therapists from around the world love about the job as well as the challenges that come with it. If not already educated on the college level, go into the behavioral or social sciences and obtain a degree that will prepare you for work on the Masters level. 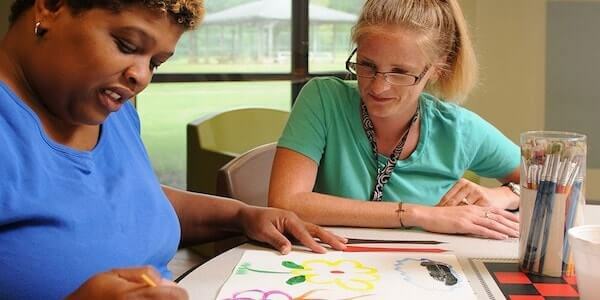 Enroll in a Masters Program from an accredited school that offers Art Therapy licensure. Become familiar and comfortable with art and its many expressions alongside your required learning for becoming a counselor. 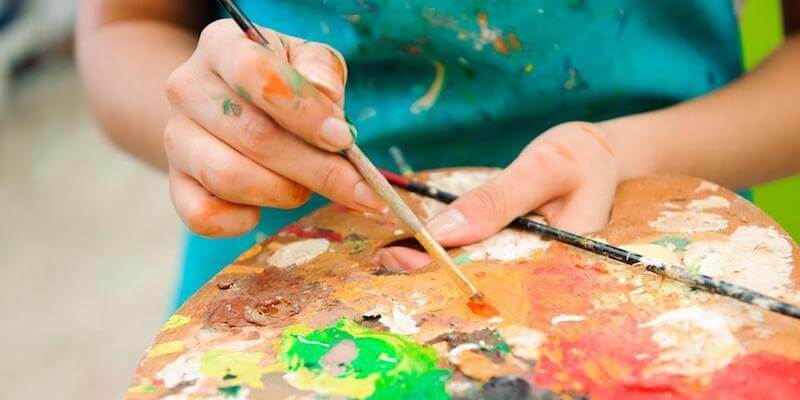 If your state currently recognizes Art Therapy as a viable counseling option, then they will likely have a state Art Therapy Association with a directory of licensed professionals in that state. Finally, it’s common to wonder whether your insurance will even cover treatment by an Art Therapist, and if that’s the case, it’s best to call your insurance provider, and they may be able to refer you to someone in your area that is covered. Art Therapy by a licensed counselor may not be as easy to come by as an adult coloring book, but the good news is that there are endless self-care activities to utilize while the world catches up and Licensed Art Therapy spreads and gains the recognition it deserves. When you feel overwhelmed, tied down, or incapable of expressing your emotions, resort to the act of creation and find confidence and peace in your ability to create. Much of Art Therapy requires time and concentration, so the first step in allowing these techniques to work their magic is to allow yourself some time. Let the speechless communication of art say what you can’t for now. Albertini, Cherubina. CONTRIBUTION OF ART THERAPY IN THE TREATMENT OF AGORAPHOBIA WITH PANIC DISORDER. (2001). American Journal of Art Therapy, 40(2), 137. Curry, N. & Kasser, T. (2005). Can Coloring Mandalas Reduce Anxiety? Art Therapy: Journal of American Art Therapy Association, 22(2), pp. 81-85. Potash, J.S., Chan, F., Ho, A.H.Y., Wang, X.L., Cheng, C. (2015). A Model for Art Therapy-Based Supervision for End-of-Life Care Workers in Hong Kong. Death Studies, 39, pp. 44-51. Taylor McCoy is a graduate of Harding University with degrees in English and Psychology. She is a published poet, short fiction writer, blogger, and novelist. She loves to make things with her hands and use her degrees to better understand people and great works of literature. I have spent 20 years as aT.A. in a primary school where I often run an art club for Infants and Junior children. Having recently joined a yoga class I have become more aware of the benefits of meditation and concentration and how it could help children in class. I am planning to start a club using some of the exercises from this site, they are very interesting especially the Zentangle and the Self Care Box. I’m sure they will enjoy the activities. Two years back when i had same question I found that in india we don’t have formal designation of Art Therapist hence we don’t have any licence authority. Also, we don’t have any degree courses though you can go for some workshops to have exposure in the field. I feel to practice as an art therapist it’s not enough, one must do complete degree to do justice with clients.